This is one of my favorite pages of Ethan and me. 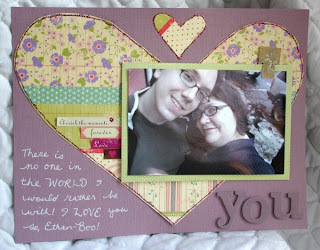 I did it with supplies I received during my month as a guest designer at Scrapperie, when they were a kit club. I took this photo on the street in Northampton. Scrapbooking is one of my favorite things to do!! Very nice layout and super cute photo! Beautiful layout! I love the big heart and the journaling! Excellent job!